Instance leveling has taken World of Warcraft by storm, and no one who’s leveling a character can afford to miss out on the action. One of the most-asked questions is about the best way to level. Instances are definitely the answer, thanks to the dungeon finder. So how does one go about practicing instance leveling? It’s very simple. Just click on the “Looking for Group” button on the bottom of your interface. It looks like a large green eye. This will bring up the dungeon finder, and from there it’s just a matter of choosing which one you want to run. 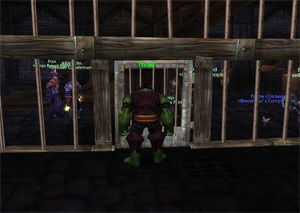 One of the first things you will notice when using the dungeon finder is that you can choose either random dungeons or to queue up for a specific one. In most cases you will want to choose the random dungeon option. This is because running random instances earns you an extra bag of goodies at the end of the run and some bonus experience. Of course usually the items in the bag of goodies won’t be worth much to you because the same few items keep appearing in those bags, depending on your level. However, enchanters will love that bag because it does give them another item to disenchant and get some enchanting materials from. Other players can vendor these items, so it also provides a little bit of extra gold. Occasionally it will be a good idea to choose specific level instances because you may have been running random instances all day and one specific dungeon that you have all the quests for just doesn’t come up. It’s definitely worth it to queue for that specific dungeon because getting several quests done all at once will probably get you an extra level or two of experience. Another thing you will notice when using the dungeon finder is that you have to select a role for your group. If your class can’t even be a healer, then that option will be grayed out, and it’s the same with the tank option. It’s very important to choose a role accurately because nothing is more annoying than landing in an instance with a tank who doesn’t know how to tank. It can be very tempting to choose the tank role because there’s little or no wait for tanks when it comes to queuing up for an instance, but some players just shouldn’t tank. It will be very clear to you early on whether you will make a good tank for the long run. DPS classes will definitely want to make good use of their down time while queued in the dungeon finder. For some levels, the wait for a DPS to get into an instance can be 20 minutes or more. The best way to make the most of your leveling time while you wait is to complete some quests in the meantime.